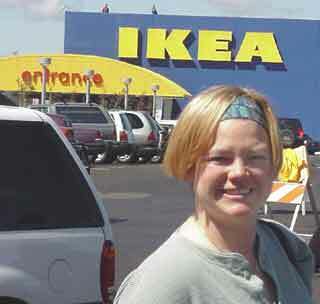 April 14, 2000: Mom stands outside IKEA. It was 2:45 when we entered the parking lot. Police stood at every entrance and traffic aisle to guide traffic. At one point we found a great parking spot, but a man in an orange jacket told us to keep driving so as not to hold up traffic! Skylars parking carma kicked in, as well as Dads verve to cut through a blockade, and we parked in just minutes. As you can see from the picture, a huge entrance sign acted as a beacon to guide us out of the parking lot (thank goodness they used an English word instead of one of their product names like Figlwart). And we were on our way to spend lots of money! Note Skylars hi-tech stroller cart. 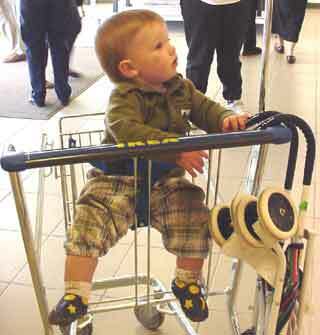 Infants arent allowed to sit in the regular carts on the second level, although they can on the ground level. 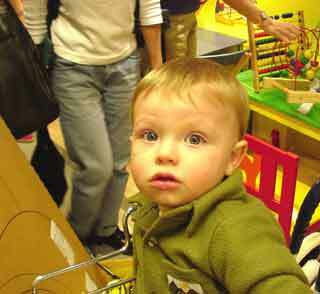 Skylar was disappointed to discover that the kids room didnt have a pool of balls; thats why there isnt a picture of him in one. 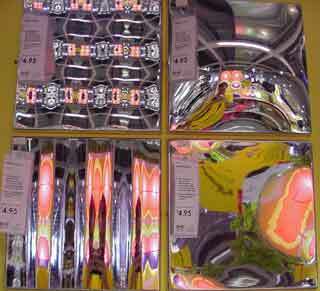 The IKEA shopping experience can be quite overwhelming. Or just too much fun! Throw a couple of these in the cart!